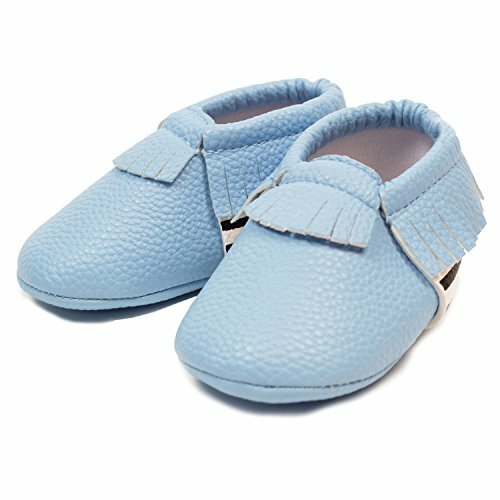 PERFECT CRIB SHOES: Do you have a newborn crawlers or baby learning to walk? These adorable shoes are designed with your baby in mind. From comfort, material relaxability, and foot protection, your baby will be crawling and walking double the pace with these designer sandals! COMFORTABLE: Lightweight soft sole with a flexible and durable outsole that helps with balance and muscle growth. Our design keeps these shoes on your baby's feet, and they sit snug to prevent stumbling. STYLISH YEAR-ROUND: Let your baby take his or her first steps in these soft sandals, and and they'll be walking like a star in no time! Great for spring, summer, and autumn! Whether they're in the house, yard, gym, daycare, your baby will love these! SIZING: We recommend a small for newborns 0-6 months, and a medium for babies 6-12 months old. 100% SATISFACTION GUARANTEED, or your money back. Do not hesitate to contact us if you have any problems! If you have any questions about this product by Frills Du Jour, contact us by completing and submitting the form below. If you are looking for a specif part number, please include it with your message.